British comic Russell Brand filed for divorce Friday to end his marriage to US pop star Katy Perry 14 months after the pair were wed in India. There will be no impact on me, of course, because I'm waiting for Summer Glau--or possibly Zooey Deschanel--to accept my standing offer for dinner at Olive Garden. Admittedly, my plans could be thrown into turmoil if Sarah Michelle Gellar goes back on the market. I'm thinking Applebees, in that case. Hey, leave me alone. I don't pick apart your delusions, do I? The invitation comes in the wake of new sanctions recently imposed by the West over Tehran's uranium enrichment program, which is a potential pathway to making nuclear arms. The last round of negotiations between Iran and the five permanent members of the U.N. Security Council plus Germany in January in Istanbul, Turkey, ended in failure. Iran continues to buy time until Iran can go nuclear. We tell ourselves that we will detect Iran's progress with enough clarity to know when that is imminent. And we pretend that when we know the threat is imminent we will do something about it with no tool off the table. I'm thinking Iran isn't wrong to assume we're willing to pretend that talking is working (for us). ... die by the peasant? Not that I think China's gains aren't real. They are surely more real than the Soviet Union's apparent progress since China is plugged into the world economy and that limits how much can be faked. But it does mean that simply assuming China continues the same rate of gain and never experiences slow downs or recessions is ridiculous. Central planning is not the path to economic prosperity. If it was, China would have taken off decades ago under strict Maoist economic planning. The funny thing is, true Marxists never believed communism could work with reactionary peasants rather than true urban workers as the basis of the revolution. China is creating lots of unhappy new urban workers and angering the true peasants. The Chinese workforce will level off in about 2013, perhaps 2014, according to both Chinese and foreign demographers, but the effect is already being felt as wages rise, a trend that will eventually make the country's factories uncompetitive. China, strangely enough, is running out of people to move to cities, work in factories, and power its economy. Demography may not be destiny, but it will now create high barriers for growth. I wouldn't trade places with China, no matter how many tyranny fan boys there are in the New York Times West. In the largest protests Syria has seen in months, hundreds of thousands of people took to the streets Friday in a display of defiance to show an Arab League observer mission the strength of the opposition movement. Syrian troops still kill protesters despite their efforts to put on a show of no killing protesters. And the armed opposition promises not to launch attacks while the monitors are on their mission. With a Sudanese delegate leading the Arab League mission (Khaddafi being unavailable), Syrian dissidents are right to wonder about what the purpose of the Arab League really is. Syria continues to buy time. I have no idea if they are buying time with anything particular in mind or just buying the only thing they can get in the hope that something happens to crack the opposition. Israel killed the leader of an al Qaeda-inspired faction in the Gaza Strip on Friday, accusing him of involvement in firing rockets and a planned attack on the Jewish state from the neighboring Egyptian Sinai. The deadly air strike was Israel's second against a Salafi Islamist militant this week. Militants identified him as Momen Abu Daf, chief of the Army of Islam, among a loose network of Palestinian groups which profess allegiance to al Qaeda and have been reinforced by volunteers who slip in from the Sinai. Hundreds of Ethiopian troops poured into a western Somalia border town on Saturday, opening a new front against the militant group al-Shabab, which now faces hostile militaries on three sides. Resident Mohammed Abdi said hundreds of residents fled Beledweyne on Saturday after hundreds of Ethiopian and Somali troops moved in. Capt. Hashi Nor of the Somali military confirmed that Somali and Ethiopian troops had moved in. Ethiopia isn't shy about killing jihadis. Last week, former Army chief of staff Gen. Gordon Sullivan editorialized that the Army is repeating the mistakes of the post-Vietnam era, when it turned away from a decade’s experience fighting a counterinsurgency war, in favor of building a more capable conventional force. This, according to General Sullivan, forced the Army to improvise its way through conflicts in Panama, Somalia, and the Balkans. General Sullivan went on to say that, despite these three experiences, we still possessed the wrong Army when we invaded Iraq in 2003. One wonders how an Army optimized to fight insurgents would have dealt with the six armored Republican Guard divisions that ringed Baghdad. General Sullivan does not address this question. What he does say is that the Army was well on its way to defeat in Iraq until, after three years of muddling through, it adopted a new counterinsurgency doctrine. Now General Sullivan fears that the Army, in its rush to put Iraq and Afghanistan behind it, will once again put its counterinsurgency skills on the shelf, as it once again turns its attention to preparing for conventional warfare. Sullivan is pretty good, but I agree with Lacey. Ever since the Persian Gulf War of 1991, some analysts have complained our Army is too heavy and needs to lighten up for faster deployment. And now, after the Iraq War, we should lighten up for counter-insurgency. Actually defeating the enemy army seems to be a given in the equation. But beating the enemy army once you are in the theater and before you can stabilize the post-war environment is not a constant in the equation--it is the heart of the war. As I noted, the need for specially trained counter-insurgency forces probably only applies to an army of draftees who would be more likely to muck up the mission. We have an excellent army. It can adapt to fight any foe. An Army trained for conventional fighting will have the time to adapt to a counter-insurgency without losing. We did that in Iraq and won. But an Army trained for counter-insurgency when faced with a conventional enemy won't get the time it needs to adapt before it is crushed in battle by an enemy army trained for conventional warfare. Conventional warfare can be much faster and far less forgiving. We don't need a counter-insurgency Army. We need a well trained and well equipped Army prepared to fight high end enemies but with leaders who understand both conventional and counter-insurgency warfare. Getting to the field of battle fast means nothing if you can't win once there. And being better prepared for the counter-insurgency means nothing if you can't defeat the enemy army in the first place. We need a full spectrum Army and the major part of that spectrum is conventional warfare. During the Iran-Iraq War in the 1980s, both Iran and Iraq went after each others oil exports to deprive the other of income. Iraq's oil exports through the Persian Gulf were immediately cut. Iran's were eventually attacked as Iraq deployed planes and anti-ship missiles to go after Iranian tankers sailing from the northern Gulf Kharg Island facilities. Since the war went on for eight years, each side adapted. Iraq exported oil by tanker trucks and through pipelines through Turkey and Syria. Iran moved oil export facilities further south to escape Iraqi planes and even looked at building facilities outside the Gulf shores. Saudi Arabia and Kuwait pondered expanding oil pipelines to the Red Sea to avoid the Gulf fighting. Apparently, more than two decades after that war, not much was done to escape the choke point of the Strait of Hormuz in Iran's shadow, because Iran's threats to close Hormuz rattle oil markets. Oil prices fell on Wednesday, after Saudi Arabia said it will offset any loss of oil from a threatened Iranian blockade of a crucial tanker route in the Middle East. The U.S. Navy warned that any disruption of traffic through the vital Strait of Hormuz "will not be tolerated." The route for this reserve capacity was not given, the article says. I assume some could flow through pipelines that bypass Hormuz. But I assume most of the replacement oil would only replace Iran's output. For Iraq, Kuwait, and other Gulf sources of oil to reach the world, they'll have to go through Hormuz. This alone should let you know that Iran couldn't stop oil traffic through the Strait of Hormuz for long. If the Saudis and other producers who rely on tankers going through Hormuz were really worried that America couldn't stop Iran from blockading the strait, they'd have built those pipelines long ago. Indeed, Saudi Arabia and the other Gulf producers might prefer to have the oil export routes "exposed" in Hormuz in order to keep American involved in the Gulf to oppose Iran generally so we can keep the oil flowing. And we may prefer that theoretical vulnerability in order to persuade Saudi Arabia to buy American weapons, which tends to bind the Saudis to us in order to keep the weapons in working order. If Iran ever grows powerful enough to actually close the Strait of Hormuz and hold it shut, pipelines will sprout across Saudi Arabia heading to the Red Sea and Arabian Sea. Of course, that's why Iran courts Eritrea at the southern outlet from the Red Sea and how pro-Iranian elements in Gaza and Lebanon could help out at the northern end of the Red Sea outlet. And why Iran exercises their navy outside the Gulf. So far, I remain confident we'd crush Iran's efforts to stop the oil flow. Normally, some 16 million barrels of oil pass through the strait daily. However, by March, Arab exporters will be using pipelines connecting them with the Arabian Sea through the emirate of Fujairah, bypassing Hormuz. Because the strait is the only route for its oil exports, Iran could end up the principal loser. Tehran’s hopes of provoking global shortages may be exaggerated. World oil stockpiles, now at the highest ever, could be released to prevent sharp price rises. Also, Russia, Norway and Angola have plans for more production in 2012. We're about as ready as we can be to face Iran's oil weapon. UPDATE: There are some pipelines out there, apparently unused while Hormuz is open. In addition to the new pipeline, if I'm reading this right (on page 20), pipelines could handle about half of the traffic that normally goes through Hormuz. That would require reopening some that probably aren't reopening any time soon. But those are smaller capacity lines. So at best, we'd need to protect 7 tankers going in and 7 going out each day to have no impact at all from Iranian threats. In the short run, releases from national and private oil reserves would cushion the impact. Not that oil prices won't spike. But eventually they would drop down somewhat. UPDATE: More on price spikes, oil reserves, and alternative pipelines. Also, while it is true that it would be stupid for Iran to close the Strait of Hormuz because they and their ally China rely on oil from there, accidents happen. And sometimes people do stupid things. At the same time that Iran was losing on the ground, Iran's navy sailed on its death ride. The naval battle was prompted by the mining of U.S.S. Samuel B. Roberts on April 14, 1988 in the first mine incident since November 1987. Five days later, America responded with Operation Praying Mantis. Designed as a proportional response to the damaged U.S. frigate, the operation involved the destruction of two Iranian oil platform bases. The Sassan platform was demolished by a Marine landing team while the Sirri platform was destroyed by naval gunfire. During this operation, an Iranian patrol boat was sunk and F-4 Phantom fighter bombers were driven off by American surface to air missile fire. Iran's response set off a chain of events that left perhaps three of her patrol boats at the bottom of the Gulf and two modern frigates smashed. American forces dodged more Iranian attacks including the impressive evasion of five Silkworms by Jack Williams. The Only American loss, a Sea Cobra attack helicopter, was lost by accident and not hostile action. I keep hoping that if we can nurture rule of law in Egypt, a victory my Islamists won't be a catastrophe as long as they have to defend their governance in a new, free election. The United States expressed deep concern on Thursday after Egyptian police raided 17 offices of pro-democracy and human rights groups, including several funded by the United States, and urged Egyptian authorities to immediately halt "harassment" of non-governmental organization staff. "We are very concerned because this is not appropriate in the current environment," State Department spokeswoman Victoria Nuland said, adding that senior US officials had been in touch with Egyptian military leaders to express their concern over the raid. Perhaps we need to offer space in our embassy for these groups to increase their safety. I don't assume the worst, but I am very concerned about Egypt. "The ambassador has sought and received Egyptian leadership assurances that the raids will cease and property will be returned immediately," U.S. State Department spokeswoman Victoria Nuland said in emailed comments. If we can defend rule of law, even winners who are bad for us (and the region and even Egyptians) can be held accountable by voters. In the short run, the Islamists and Islamist-friendly groups have credibility from many years of opposing Mubarak's regime. In the long run, people won't like them much. The problem is holding the ring until the long run arrives to minimize the damage they might do. In the medium run, unless the forces that defend rule of law are successful, the Islamists could use elections to get inside the government prior to seizing power, as Hamas did in Gaza (or the Nazis in Germany, for that matter). I assume Panetta was involved to discuss the effects of losing our military support. Remember, Egypt's military uses US equipment. Losing our support would mean that over time the military would erode. Yet three decades after switching from being a Soviet ally to being an American ally, Egypt still has Soviet-designed equipment in their arsenal. So the Egyptians surely know that they'd doom their military to a generation of new turmoil if the Egyptians do something that loses them our support. And the Soviet Union is no longer there to provide the cash for new weapons. Russia would be happy to sell the stuff but the old terms are long gone. Nor is China likely to pick up the tab for Egypt. And after having American weapons, China's stuff won't seem so shiny even when freshly unwrapped. One of the weapons that threaten our M-1 Abrams is the top-attack anti-tank missile. Armor on the top of tanks is much thinner than on the front or even the sides. Active defenses that would shoot down these missiles (and any other missiles) are being developed. But why can't we use methods that have worked to protect our light armor with thin armor on the front and sides from standard anti-tank weapons? My worry about the Stryker in combat was highlighted by the fact that the Army did not send the vehicle into combat as is. We put metal cages around the vehicle to detonate incoming infantry-fired HEAT rounds to disrupt the molten stream that would burn through the thin armor had it hit the armored hull directly. It worked. Could we mount a similar (and cheap) slat armor on the top of the turret and over the rear engine compartment to block top-attack warheads? Could reactive armor panels facing up also work? I don't think heavy armor is obsolete. But weapons are out there that can kill them. I updated my post with more details on the Australian army reorganization that I mentioned earlier. Or you can just read the new article here. "We will never engage with the Lee Myung-bak administration," said the announcer. No outreach here from The Un. “The optics of this are terrible,” said Kenneth M. Pollack, an expert on national security issues at the Brookings Institution in Washington and a critic of the administration’s Iraq policy. The optics are bad? That's ridiculous. Why would we keep Iraq more vulnerable to Iranian pressure by prolonging their lack of conventional combat capability? And why would we--before Iraq is locked into American equipment (that requires a relationship with us to maintain)--compel Iraq to look to Soviet or Chinese arms that would diminish our ability to influence Iraq through military ties? What are the optics of looking like an unreliable ally? What are the optics of selling 5-1/2 times as much to Saudi Arabia (including F-15SA--is that a typo and they are getting F-15SE, Silent Eagle with frontal stealth attributes? ), which oppresses its Shia minority and hasn't progressed to levels of democracy that Iraq has regressed to in this crisis, just because the Shia majority might be treating the Sunni Arabs high handedly? I will not complain about selling weapons that Iraq needs to resist Iranian pressure. The sooner Iraqis feel secure versus Iran, the sooner the natural divisions can win out over Iraqis' fear of Iran and give Iraq the confidence to root out subversive Iranian influence. Somehow, we need to find out ways to guarantee to the Shias that we won't allow the Sunni Arabs to take over in a coup (and the pro-Iranian Sadrists for that matter) and guarantee the Sunni Arabs that we will make sure that they have the protections of rule of law in Iraq under a Shia-majority state. I think that we should return to Iraq in force. Remember that in mid-1950, we had but a single infantry division in West Germany. But the post-war situation was not what we hoped it would be, so to defend West Germany (and the rest of Western Europe), by the end of the Korean War--even as we built up our armed forces to fight there--we increased our Army in West Germany to five divisions. And we reassured our German friends that we'd defend forward in West Germany rather than consider West Germany expendable as we retreated to the more defensible Rhine River barrier. I've long thought (for decades) that Cordesman knows his stuff on explaining what is happening in regard to military matters. But I often strongly disagree with his conclusions based on what he explains. The US has gone to great lengths to counter Iranian influence in Iraq, including using its status as an occupying power and Iraq’s main source of aid, as well as through information operations and more traditional press statements highlighting Iranian meddling. However, containing Iranian influence, while important, is not America’s main goal in Iraq. It is rather to create a stable democratic Iraq that can defeat the remaining extremist and insurgent elements, defend against foreign threats, sustain an able civil society, and emerge as a stable power friendly to the US and its Gulf allies. America’s ability to achieve this goal is highly uncertain. US and Iraqi forces scored impressive tactical victories against the insurgents in Iraq from 2005-2009, but the US invasion now seems to be a de facto grand strategic failure in terms of its cost in dollars and blood, its post-conflict strategic outcome, and the value the US could have obtained from different uses of its political, military, and economic resources. The US went to war for the wrong reasons – focusing on threats from weapons of mass destruction and Iraqi-government sponsored terrorism that did not exist. It had no meaningful plan for either stability operations or nation building. It let Iraq slide into a half decade of civil war, and failed to build an effective democracy and base for Iraq’s economic development. Its tactical victories – if they last – did little more than put an end to a conflict it help create, and the US failed to establish anything like the strategic partnership it sought. I don't even disagree with his summation of our objectives for Iraq: "to create a stable democratic Iraq that can defeat the remaining extremist and insurgent elements, defend against foreign threats, sustain an able civil society, and emerge as a stable power friendly to the US and its Gulf allies." Of course, that's why I think we should have retained 25,000 troops in Iraq after this year. That is what makes the outcome more uncertain, I think. And countering Iranian influence in Iraq--at least in the sense of stopping Iran from supporting armed elements within Iraq--helps achieve our objectives. But the idea that the Iraq War is a grand strategic failure seems very short-sighted. Certainly, if we throw away what we achieved and fail to exploit that victory for wider victories, you could make that case. But that is not a case against the war but against the "peace" that followed. And there were definitely terrorists in Iraq and Iraq supported terrorism. Including al Qaeda affiliates who fled Afghanistan to the peripheral but technically Kurdish region (and drew supplies from the city of Baghdad). Don't forget that Saddam also was importing lots of Sunni Arab jihadis into Iraq for Saddam's Fedayeen, which was a paramilitary force that savagely fought our troops in the invasion (we killed lots). The idea that this was not a reason to destroy Saddam is astounding. The rest of that paragraph is just wrong, too. We certainly had a plan for Iraq. We assumed that by not attacking the infrastructure of Iraq we would avoid the need to rebuild it. We assumed local police could handle policing with a paramilitary force we built to support it and a small rebuilt conventional army of 40,000 to form the core of an army eventually capable of external defenses. We assumed Iraqi oil exports could pay for the project. And we certainly assumed that Syria and Iran would not invade Iraq. We assumed that after a couple years we could turn over to Iraqis a recovering economy and the framework of democracy. Obviously, these assumptions did not work out. That happens. Contact with the enemy, and all that. The infrastructure was already broken down and required far more building even though we did not strike it in 2003. Local police were glorified traffic cops while "policing" under Saddam was outsourced to Sunni gangs. So these guys were worthless. And while we were successfully grinding down the Baathist insurgency, capturing Saddam in December 2003, and seeing only 20 KIA in the month of February 2004, a new war broke out when Syria and Iran invaded Iraq by supporting al Qaeda, Baathist, and Sadrist terrorists beginning in spring 2004. Saying we "let" Iraq slide into a half decade of civil war ignores that there was violence because we resisted the enemy attempts to destroy the now-liberated Iraq. Avoiding a civil war would have meant just letting the enemy win (and I will quibble that while civil war threatened, the sectarian fighting didn't rise to civil war scope). The paramilitaries we established were inadequate to this new war, and the external focus of the army was looking too far ahead, so we merged both of them into a light infantry army focused on internal security. We achieved this despite the renewed Syrian and Iranian effort after the February 2006 Samara mosque bombing that threatened to really ignite a true civil war. Only now are we working on a conventional military capability. But the Petraeus surge and the Sunni Awakening halted the enemy success and finally broke enemy resistance by the fall of 2007. And despite terrorist attacks, we greatly expanded pre-war electricity, potable water, and economic life--including getting oil production at least in the same range as pre-war production. Iraq has a better economic basis than a lot of other countries. Iraq indeed has a functioning democracy even if it hasn't sunk deep roots yet and even though post-withdrawal unrest threatens that democracy. Even if you leave aside what we really achieved, calling Iraq only a victory in a war we created ignores that by destroying the Saddam regime we ended a looming threat to Kuwait and Saudi Arabia and ended a supporter of terrorism and nuclear proliferation. Saddam wanted to be the dominant power in the Gulf, in the Arab World, and in what was called during the Cold War the nonaligned movement. Instead, Iraq is an ally actively killing jihadis and remnant Baathists and resisting Iran. So the difficult task of "dual containment" where we tried to contain both Iraq and Iran (while worried a new "Nazi-Soviet" pact could unite them against us) is no longer needed. And we can't know the wider implications for a while yet. Some Iraqis certainly believe they had a role in inspiring the Arab Spring. They could be right. In early 2005, it sure looked like Iraq could just be part of a wave of democracy making progress. Intensified violence in Iraq from 2006 to 2007 seemed to squelch that change, but after we put down most of the violence in Iraq, it is not far-fetched to think the inspiration at least partly arose from these ashes. And who knows if the 2009 protests in Iran were inspired by seeing fellow Shias attempting--however imperfectly--to run their own lives freely in Iraq? Even if Iraq wasn't a positive example for Syria, could the long effort to destabilize Iraq by hosting Sunni Arab terrorists have backfired on Assad? A million or so Sunni Arab Baathist refugees from Iraq with lots of money and an al Qaeda terrorist infrastructure whose pipeline into Iraq stopped feeding many jihadis into Iraq (more from the inability of the remnant terrorists to use all of them than from Syrian or even Iraq border defense success) could have led to a little blowback. Perhaps some jihadis turned on Assad. Perhaps some Iraqi Baathists turned on Assad. Perhaps just seeing all those Sunni Baathist refugees reminded Syria's Sunni Arab majority that they were perhaps worse off than the Iraqi Sunni refugees and that Alawites ruled them all. In the end, if we fail to establish a strategic partnership with Iraq and ultimately "lose" Iraq, it will stem not from the Iraq War itself which achieved a lot and raised hopes for achieving even more, but from the absolute failure of the Obama administration to do anything over the past three years but prepare to get American troops out of Iraq. Three years of possessing the most awesome, nuanced, "smart" diplomacy known to liberal man failed to get a deal with Iraq that we have made with countless (well, "countless" because I don't know the number) other countries over the decades to maintain American troops on foreign soil. If Iraq turns into a "grand strategic failure" (and I think it would have to include an Iraq returning to a hostile, aggressive power as it was under Saddam), the fault will not be the decision to fight Saddam or the victory in the war itself, but will be the fault of the Obama administration that values getting out of Iraq ("responsibly" as President Obama chants to ward off charges he is losing Iraq) more than it values defending what their despised predecessor in the Oval Office achieved. It seems clear that the United States doesn't want Iran to go nuclear in 2012 (well, not until mid-November, anyway) and doesn't want Israel to strike Iran in that time. The Obama administration is trying to assure Israel privately that it would strike Iran militarily if Tehran’s nuclear program crosses certain “red lines”—while attempting to dissuade the Israelis from acting unilaterally. That fits my assessment of the situation. But I also worry that Iran is well aware of what our red lines might be and will attempt to distract us with progress toward those red lines while they buy nuclear weapons from someone to deter an attack until Iran can safely cross those red lines to indigenous nuclear capabilities. And does Israel trust that the Obama administration would strike, given that our government's goal may only to be to delay the day Iran crosses red lines past election day in November 2012? I'll guess that Israel will accept the deal but that they will be the ones to judge if Iran crosses a red line and then tell us that we have a certain amount of time to make good on our pledge to strike before Israel tries to do the job. There's still that problem of whether Iran is working with full knowledge of what will trigger a strike. And there's also the problem of having back up programs dispersed to other countries in order to rebuild in Iran after the dust settles. Still, maybe we are ahead of the Iranians and our military isn't counting on our intelligence organizations to (for the first time) give our leaders accurate warnings of when a state goes nuclear. Though not likely, a collapse and civil war would be disastrous for both Koreas. A North Korean invasion of South Korea would be a disaster. A North Korean sustained barrage of Seoul would be a disaster. A North Korean use of nuclear weapons would be a disaster. But the collapse of North Korea and a subsequent civil war up there, unless it led to one of those named disasters, would not be a disaster for both Koreas. For North Koreans, the intense violence of collapse and civil war would at least offer the hope that the numbing institutionalized violence of the regime might end. For South Korea, the price of collapse would be expensive in monetary terms, no doubt. But is it really appropriate to term that a disaster when the alternative could be the continuation of the looming nuclear threat? Would it really be better for the North Koreans to recover and become a more robust threat? North Korea's collapse would be a lot of things potentially. Uncertain? Sure? Dangerous? You bet. But "disaster" doesn't enter into my play book at this point. Mind you, everyone can have different objectives. That's the way the world works. But from our point of view, a collapse of North Korea before they get nuclear-armed missiles would be very good, indeed. "Closing the Strait of Hormuz for Iran's armed forces is really easy ... or as Iranians say it will be easier than drinking a glass of water," Iran's navy chief Habibollah Sayyari told Iran's English language Press TV. Sure, step one is easy. Iran could close Hormuz. But we'd take the next 11 steps to recovery from that. We'd reopen the strait and the rest of the world would be in such a panic over their oil supplies that they'd join us. Iran would find themselves drinking from a fire hose. And we would not let Iran use the Strait of Hormuz if they go through with their threat, so Iran would have very little income at all (just what they could get shipping oil by truck overland to neighboring countries through smuggling) and would get very little refined oil products imported (by the same overland routes). Also, we'd sink the Iranian fleet and pound any shore installation like air bases or missile launchers that attempt to keep the Strait of Hormuz closed. Soldiers are likely to begin coming home from Europe next year, sooner than the planned drawdown in 2015. About 40,000 soldiers — and about 100,000 dependents — are currently stationed in Europe, most of them in Germany. Among them are four brigade combat teams, three in Germany and a fourth in Vicenza, Italy. The long-term plan calls for bringing one of those brigades home — leaving Europe with three BCTs. It’s up to the Army to choose which of the four brigades will come home and when. I think we need to retain a robust Army in Europe. I like defending our gains. Europe is too big of a prize to assume everything will always be fine in the future. Our presence in Iraq has dropped off a cliff to virtually nothing that matters at this stage of the game. We should have kept tens of thousands of troops in Iraq for years and maybe decades to come. Protecting Iraq from external attack and building rule of law in Iraq are now our main tasks for our military. But we pulled our military out making the latter much more difficult, in particular. This is no new opinion of mine as I've written for a long time. I wrote that before the February 2006 mosque attack that signalled the beginning of Iranian- and Syrian-supported sectarian slaughter that nearly drove Iraq to a civil war. By the end of 2005, it seemed like the Iraqi government was gaining the ability to fight the insurgencies and terrorism with reduced direct American help. But our enemies weren't done yet. With difficulty, we endured that enemy offensive in 2006 and then defeated them in 2007. We actually could see the emergence of the path of evolving our military presence to support for protecting Iraq from internal and external enemies until Iraq could stand on their own without us. Eventually we could have gotten to what we did this month--near total withdrawal--but with Iraq secured. Our enemies still aren't done yet, even though they are much weaker because of what we achieved while our military was in Iraq. But our premature departure may have again made victory seem within reach to our enemies. Our military presence should have evolved rather than become extinct. We still have time to reverse this major strategic error by the Obama administration. Does the Obama administration have the courage to reverse this mistake in time to defend what we achieved? Or are they only looking for excuses to avoid being blamed for anything bad that happens before November 2012? Tens of thousands of North Koreans lined snow-covered streets on Wednesday, wailing and clutching their chests as a black hearse carried late leader Kim Jong Il's body through the capital for a final farewell that ended with a 21-gun salute. 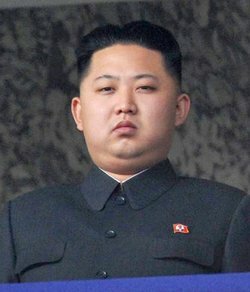 I guess we'll all be surprised to find out just what Kim Jong-Un really is. Is Wukan a symptom of economic problems that could lead to more Wukans? On Monday Zhu said the protests, which attracted worldwide media attention, resulted from local leaders' failure to address the villagers' complaints and refusal to consult them on decisions about collectively owned land. And he warned of further unrest in China if such problems were not addressed. "The public's awareness of democracy, equality and rights is continually getting stronger, and as a result their demands are growing," he said at the meeting. "The task of managing the masses is becoming more and more difficult." He won't be the first of the ruling elite to notice that the peasants are revolting. China has slowly ramped up the rhetoric ahead of Taiwan's January 14 presidential and parliamentary polls, offering both economic incentives for the self-ruled island and making veiled threats that a vote for the DPP would harm vital trade ties. Beijing will be hoping that pro-China President Ma Ying-jeou, who has signed a series of landmark agreements with Beijing since he became Taiwan's president in 2008, gets back into office and continues his policy of detente. I imagine Peking would love to put out the story that voting for people Peking likes is the only acceptable form of "democracy." That makes voting both less appealing to people and less threatening to Peking. UPDATE: China is certainly cracking down lately, despite the apparent retreat from Wukan. Clearly, there must be more to crack down on. Or, at least that the rulers think there is more to crack down on--which could create reasons for the public to resist Peking if it didn't already exist. Is this cheese-eating surrender monkey still around? God, I had enough of her back when the Iraq War raged and she still runs the Institute of Retreat. She is still condemning the Iraq War, demonstrating as I feared that many on the anti-war left would love it if Iraq failed. Let me move past the ideas that our casualties staggered us (we suffered losses at historically low rates and was not enough to stop us from winning or to break our Army). Or that the Iraq War made us broke (we spent more in one stimulus spending signature than we did in the Iraq War up to then, and as a percent of GDP the war was very cheap compared to World War II). Or that we will now need to replace weapons and equipment (I wish. And are we seriously to believe she wishes we could have replaced Cold War weapons had we not fought in Iraq?). Or that the cost of veterans or wounded is too high (World War II veterans added way more and the numbers of wounded veterans from Iraq won't reverse that). Or that the war left us with high oil prices (it didn't--but if it did, didn't the anti-war side say they wanted the public to sacrifice? And didn't our current president say he wanted higher oil prices to usher in our new Green future?). Or that we don't know why we went to war (the declaration of war laid them out). Or that Bush planned to defeat Saddam 8 months before 9/11 (so why did he wait and wasn't he just trying to implement the Clinton-era law that said regime change was the official policy of the United States?). Or that intelligence was twisted (every intelligence agency--in the world--believed Saddam was hiding something and even Colin Powell was convinced by the evidence). What’s less well-known, however, is that at the same time, United Nations inspectors were getting the story right. Their assessments of Iraq’s nuclear, chemical, biological and missile programs in the months leading up to the war were remarkably close to what was later found. Yet by insisting on invading before these inspections had time to succeed, the United States aborted what could have been a striking international success. This is nonsense on ice. In our pre-war attempt to get Saddam to come clean on WMD, the UN concluded that Saddam had not explained what it had done with everything we knew they had before the 1991 war was won. The reality was that Saddam's nuclear program was at a standstill. But he retained the scientists and infrastructure to restart it. We also had the lesson of 1991 that Saddam was far closer to nukes than we imagined until we won that war. The reality was that our post-2003 invasion investigation showed that Saddam's chemical weapons production capability was ready to be restarted within months of a decision to do so with supplies and infrastructure in place. Until Syria and perhaps some French and Russian sources open up, I don't assume Saddam had no chemical weapons before we invaded. The reality was that the biological component was small but didn't need to be large to succeed. And we knew that in the mid-1990s Saddam had restarted that under the noses of inspections that followed the 1991 war. The basic reality was that Saddam wanted WMD, wanted Iran to believe he had them until he could get them, and could have gotten them as sanctions collapsed under the constant propaganda barrage that poor Iraqi children were starving under sanctions even as Saddam built palaces (that were off limits to inspectors). The basic reality was that Saddam had turned inspections on its head and Mathews accepts that. The Iraqis were supposed to show us exactly how they disarmed. It was not supposed to be a game of hide and seek where we seek and they hide. But that is exactly what it became. Under these circumstances, we could never conclude with certainty that Saddam had disarmed. There would always be doubt--in no small part because Saddam wanted that doubt to exist. No matter how many years went on, we'd always be in the position of saying we haven't found what we know Saddam had but has not confirmed he destroyed. Her whining that--even 12 years after the war--the inspectors still hadn't had the chance to visit all the new sites they wanted to search demonstrates the bankruptcy of what was supposed to be a rapid process that counted on the full cooperation of the defeated Iraqis. Yet she assures us that it would have taken only another year to confirm disarmament! And in her fantasy world, open ended inspections would have continued with Iraqi cooperation, apparently. And even if we did confirm that WMD programs and research were gone, sanctions would end. Who believes Saddam would not have been off to the races with WMD development at that point? In the end, the "success" would be the success of pretending we had disarmed a thug through UN inspections and the success of allowing Saddam to pretend we had succeeded--for a while. Until he had no reason to pretend. From it, a WMD enforcement mechanism could have been built for use not only in Iraq but also in North Korea, Libya, Syria, Iran and elsewhere. She thinks the threat of force for this new body would have worked, saying even Saddam retreated in the face of force, despite the fact that Saddam would not retreat even in the face of a US-led invasion army massed on his border poised to invade. And other rogue countries would have fallen in line! Sadly, Saddam was the one who got to (repeatedly) deliver the punch line, "I forgot." And when confronted with her idiocy had we followed her brilliant plan, Ms. Mathews could deliver "Well excuse me!" to explain the error. Face it, the only way to make sure that Saddam didn't get WMD was to destroy Saddam' regime. Mission accomplished. Pretending that we missed a fantasy world of magical international success and thug cooperation because we destroyed the Saddam regime and put a developing democracy in its place is just madness. My God, Ms. Mathews really doesn't have two working brain cells to rub together, does she? When I said we rich guys should have higher federal tax rates, I didn't mean that I wanted to pay more money to the federal government! Higher tax rates are one thing. Rich people have lots of attorneys to figure out how to get around that technicality. Actually paying more money is another altogether. That is reserved for the people who don't have attorneys to exploit the rules. Face it, any rich person who thinks they should give back more to society can instruct their tax people to avoid tax loopholes. And if they can't do that, they can simply write checks to the Treasury Department as a donation. UPDATE: I know that proponents of increasing taxes on the wealthy ask why can't we go back to top rates of the Clinton era when the wealthy did fine. One, that won't come close to providing the revenue we need to balance the budget. Two, if I concede that we go back to Clinton-era tax rates, we should go back to Clinton-era spending levels as a percent of our GDP. Do that--but address the spending side first since I'm tired of these tax-hike-spending cut deals that always falter at the spending cut portion. Yes, I realize that our GDP has taken a hit so the denominator is affected, but even official projections that assume revenue as a percent of GDP rises above pre-recession levels, our spending as a percent of GDP stays high (see table 1.2). Already we see that for all the liberal whining that evil Republicans are starving orphans and puppies, that our spending has not actually declined (see table 1.1). I'm willing to address the revenue side if it helps get us in balance. But it is clear we spend too much and not that we tax too little. Critics of the European project may feel vindicated, but they should not be pleased. About 40 percent of British trade, and 15 percent of U.S. trade, is conducted with continental Europe. The fates of American, British and other European banks are closely tied. The breakup of the euro zone would not be amicable or orderly. Even those of Thatcherite sympathies have little choice but to root for Europe now. Like Hell I have no choice but to root for "Europe" now. I shall root for European nations and for European people. But I do not in any way root for Europe. Fifteen percent of our trade isn't going to just disappear. Europeans will still need to buy stuff and while any economic crisis harms us in the short run, this is the price we have to pay for preventing the rise of the Soviet Union Lite ruled from Brussels. And how are the European elites making a choice to benefit Europeans rather than the euro currency that is the foundation of their grand goal of political union? Far from saving Europe, the EU elites seem to be shoveling their dwindling money into a burning building. I shall repeat what I think of the European Union: Die. With festering boils, just die. The sooner the better to cut their losses, I'd say. Egyptians working in the tourism industry worry that conservatives in the next parliament may have a negative impact on their business. For tourists this could mean a ban on alcohol and wearing bikinis on the beaches. A spokesman for the Salafi Nour party recently suggested that pharaonic monuments like the Sphinx are idolatrous and should be covered up. Salafis say they do not want to hurt tourism, though, just make it "sin-free." They have put forth several suggestions, including gender-segregated beaches, and allowing tourists to drink alcohol only in their hotel rooms. I'm no expert on tourism, but I'm thinking that booking a tour of Egypt where you get to sit in your room and drink alone isn't going to translate well into a brochure. Sin-free vacationing is not a marketing winner--as Thailand could explain to the Egyptians. Are the Egyptians really going to go with, "What happens here, gets lopped off here"? With the army and elites trying to maneuver between the parliamentary factions, I don't assume the Islamists will seize control of Egypt. I think I can say with certainty that having a pro-American authoritarian ruler for the last three decades didn't create a better voting pool to handle freedom of choice when the people got the chance. But if the elites can't block the Islamists, since the Islamists are broken into different parties and without oil to conceal the bankruptcy of Islamist-friendly governance, the Islamists in Egypt shouldn't have the option of going down the Iran road (with allowances for being neither Shia nor Persian, of course). Why is it my problem (and yours) that they were stupid? I love that poster. That student borrows money--nobody forced a signature--and now when reality kicks in, the borrower wants someone else to pay. As the video mentions, non-teaching missions and luxurious student accommodations that make a modern campus more like a walled resort designed to attract people with no business seeking a college degree (and grade inflation to let them think they learned something) than a place of learning have made education too expensive. And simply providing more loans is not the answer. And making those "loans" simply grants from our broke treasury after the fact is even worse. Colleges should spin off their research arm from the teaching portion and let the former operate as a business, leaving the teaching part with far lower overhead. And make on-campus housing spartan and safe--and affordable--leaving the luxury junk for off-campus private business to cater to those who want to live in a resort in between spring break trips to actual resorts. But back to the question of who is going to pay that loan back now for their straight-A GPA in a useless degree? I say the person who took out that loan. If that's the only lesson they get out of college, tough luck. Let's just hope that out of the wreckage of their debt, a better future of education is built. They can think of their sacrifices like those of the World War II generation who sacrificed years of their lives in war, but who suffered actual wounds to help build a better future (or death, meaning they didn't get to see the better future) rather than just a troubling credit rating. In noting the post-withdrawal violence in Iraq and the political battles that threaten to unravel the political system, I've noted two major things. One, that Iraqis have endured similar problems in the past and have come through them; and two, our military presence functioned as a safety net that helped keep the problems contained to the political sphere. Administration officials, for their part, countered that it was hard to see how American troops could have prevented either the political crisis or the coordinated attacks in Iraq. Are you kidding me? Our troops weren't out there on the streets, but our mere presence in bases was a safety net that let Iraqi politicians know that they couldn't get away with armed responses to political opposition and also that they were safe from armed responses to their political moves. So yeah, political crises were resolved in the past. I'll even concede that the political crisis might be resolved again after everyone goes to the brink--even without our troops there. Maybe our behind the scenes diplomacy will work this time. I don't assume we've "lost" Iraq. I'll go further and admit that even with 25,000 American troops in Iraq we couldn't guarantee success. A lot does depend on the Iraqis taking advantage of the great opportunity we've given them. But liberating Iraq isn't just a gift to Iraq. The outcome affects us, and trying to influence events to a stable pro-American democracy of some sort is in our interests. And having a sizable American force in Iraq will help Iraqis resolve crises in ways that bolster Iraq's democratic future and therefore our interests. Good grief, people, Eastern Europeans still need help to cement democracy after breaking free of communism's grip two decades ago. The Obama administration needs to reverse their opposition to an American troop presence in Iraq and open discussions with the Iraqi government about what we can find mutually acceptable in the new year. So is the American two-ocean navy capable of fighting a naval enemy in both the Pacific and Atlantic dying? The chances of boosting the size of the fleet appear slim in austere fiscal times. It’s more likely to dwindle further. If it does, missions may have to contract with it to restore some equilibrium to fleet operations. Indeed, one gets the sense that the Navy’s “two-ocean strategy” of the past seven decades is being repealed – if not by conscious choice, then by dint of heavy demand, soaring shipbuilding costs, and the resultant downward pressure on the fleet’s size. Congress and the Franklin Roosevelt administration passed the “Two Ocean Navy Act” in 1940 in order to confront two hostile sea powers, Imperial Japan and Nazi Germany. In effect, the United States built a second navy so it could keep one self-sufficient battle fleet in the Atlantic Ocean and another in the Pacific. FDR & co. inaugurated a strategic approach that endures to this day yet looks increasingly perishable. The United States Navy is shrinking and our missions aren't. So we have to do something. This article lays out the somethings options. I have another idea. Set a number of platforms that we need to perform the missions we need to protect ourselves. Then build ships to reach that number. Oh, they don't all have to be Ford super carriers or high end Aegis cruisers/destroyers. We really can build some less capable and cheaper ships for many missions. Remember, our fleet is composed primarily of high end ships, unlike the past when we had a core of capable ships and then cheaper, less capable, and more numerous escorts. In a version of grade inflation, our destroyers are no longer the cheap tin cans of World War II but high end ships that are amongst our most capable. Our Navy refused to do that realistically and so in effect made a choice for far fewer hulls. Yes, when the Soviet Union died, we lost the reason we had that prompted FDR's decision. Our 6th Fleet is a shadow riding on reputation and the Atlantic is as secure as it ever has been. Truth be told, we don't need a two ocean navy in FDR's view of the separated Atlantic and Pacific. We do need a two ocean navy in the sense of needing naval forces for the Pacific and, in a supporting role, the Indian Ocean's periphery near the Persian Gulf. That's been a clear trend that I think will continue. But whatever our deployment needs, we'll still need a two-ocean Navy in the sense that our ships will be based both in the Atlantic and Pacific. One, we have a lot of facilities on the East Coast and we aren't going to abandon them and rebuild them on the West Coast. Two, Atlantic bases will be more secure from attack by a Pacific foe. Three, just basing forces in the Atlantic is necessary for Latin American and African missions. Atlantic-based vessels can also feed rotations into the Pacific Ocean as well as feeding the Mediterranean and Persian Gulf region. The former journeys can include show-the-flag port visits to provide a virtual presence along their transit route to the Western Pacific or Australia. So we'll have a fleet based on two oceans. But naturally the focus of our fleet is on a single ocean--the Pacific. But this post-FDR and post-Cold War era doesn't mean that our debate over the number of ships we need must change. A focus on a single ocean today and the future doesn't imply that we need half the ships we needed when we assumed the Atlantic and the Mediterranean extension would be the major naval battlefield if it came to a hot war with the Soviets. Even that situation was different from FDR's world. Back in the Cold War, recall, the Pacific Ocean was clearly a secondary theater for a fight with the Soviets. So in a sense we are just changing what ocean we focus on. Let's not pretend that a Pacific focus in the future implies we don't need to have more ships than we think we can afford. Supreme Commander of the Who? Kim Jong-Un has been named "supreme commander:"
North Korea's ruling party Saturday hailed the son of late leader Kim Jong-Il as "supreme commander" of the military, in the latest sign that the untested successor is tightening his grip on power. Experts said the move indicated that Pyongyang would maintain its Songun (military-first) policy, blamed for the deaths of thousands of people to starvation as the isolated regime diverts resources to its armed forces. Well, it does have to be ratified at the bi-weekly meeting with a simple majority (as a purely internal affair). No word on who the moistened bint is. Although the farcical aquatic ceremony may involve sinking a South Korean naval vessel. Seriously, the maintenance of the "military first" policy begs the question of first for what? North Korea is starving and breaking down. There isn't anything to be first for--unless the population gets virtually nothing at all. This is why North Korea went to a policy of relying on spooks and nukes for the security of the kooks, in the first place. The nukes for external defense and the spooks to control the people and make sure the army remains loyal. Apparently that last part is the most dangerous weak spot (and the spooks were looking shaky, too). Leaving a powerful (against internal foes, anyway) army in place but impoverished seemed like folly to me. The spooks and nukes policy requires a much smaller army that is big enough for internal security but small enough to avoid becoming too hungry to remain loyal itself. How much more can be taken from the people without inducing enough despair for either revolt or to just lay down and die? And will the lower ranks really kill their own families to keep their officers in bon bons and French wine? Or will someone rescue them with foreign aid? It shouldn't be us. If we ramp up aid, we are on notice that under Songun, what we send won't make it to the North Korean people. If a new military-first policy is to be put in place, at least make sure China pays for it if China is unwilling to rein in their rabid lap dog. I didn't have a problem when Bush did it. I don't now. How about the Left's view on this? Hmmm? Shoot, I actually appreciate the honesty involved. It lets everyone know that there is a dispute between two branches about the legality of a law. Congress can rewrite the contested portions to address concerns or insist the executive branch implements the law. Outside parties can look for opportunities to sue in court to either block the law or compel obedience. Congress might want to consider mandating signing statements. It sure is refreshing to see how hope and change can solve any constitutional question. Phew! Pakistanis narrowly escaped a rendezvous with reality! A briefing by the head of the U.S. Central Command to Pakistani officials on a November 26 cross-border NATO air attack that killed 24 Pakistani soldiers and severely strained ties with Washington has been cancelled, a Pakistani official said on Friday. Still, let's not underestimate the Pakistanis who are clearly capable of denying reality staring them right in the face--and with a PowerPoint presentation. Merry Christmas and a heart-felt wish for peace on Earth in the New Year. Although remember that others get a vote on questions of war or peace. If you celebrate something other than Christmas? Have a happy or merry one of those, too. I know I've heard some on the left side of the aisle complain that with so many problems, our right spends too much time complaining about the war on Christmas. I confess that while it annoys me, and I side with the right on this sentiment, it isn't a top tier worry for me. But I'd like to remind people who think that the right wastes time on this issue that if it wasn't for the fact that somebody on the left thinks that despite our problems it is worth waging war to purge the very mention of Christmas for fear of creating a Christianist theocracy (or whatever they fear), there wouldn't be something for the right to react against. I mean, really, don't we have enough problems without wasting time on purging Christmas from the public sphere? But I digress (as I can). I did bust open the egg nog a couple days ago for the first time since last season, so I may be a bit woozy in bliss. Lord, I don't know what "nog" is but it sure makes the egg taste heavenly. Don't forget that tonight NORAD will track Santa. Your little ones will like it. Lamb hasn't reacted to this site much, but Mister admits that he was pretty much in awe despite not looking at it much when I showed it to him some years ago when he believed. Apparently just a glimpse of the big guy in action was almost too much to bear. So maybe Lamb just isn't saying much. UPDATE: I think fathers should use any occasion for life lessons. Christmas is no exception. So after filling a mug with candy last night prior to wrapping it, I give the leftovers in the bag to Mister. I say, "Here, I don't need these." And he was suspicious, wanting to know what that meant. I said the words speak for themselves. But "why" don't you need them, he asked? Leading to exchanges where I ate a single one to reassure him they were not poisoned. I provided a caveat, "Unless I've been spending the last several years building up an immunity to whatever poison is in there." Mister was faux outraged. Although I did ask him if he was seeing double, or anything. So I finally explained it was excess from a present. Candy was eaten. This is where I sprung the lesson. "So you believed the words of reassurance of someone you thought was willing to poison you? Really, son, if I'm willing to poison you, I'm willing to lie to you about poisoning you. Just saying." Lamb imparted a lesson to me last night, reminding me to put a cloth down to make sure the reindeer don't make a mess with their carrot-eating during the Santa run. We of course baked cookies for Santa. And I have milk. And carrots for the reindeer. But in addition to the thank you note on Santa note pad paper and cookie crumbs in the dish, I gnaw on carrots to leave bits scattered around the plate on the ground. That made quite the impression on Lamb the first time I did that (I've never topped my mom's and sister's ploy of dipping the cat's back paws in food coloring and "hopping" her across the kitchen floor on Easter when I was little). Ah, this is probably Lamb's last year of belief in Santa. On the bright side, some stranger will no longer get credit for some of the cooler presents. I remain horrified that the Obama administration walked away from Iraq by declining to unleash their smart diplomacy to convince Iraqis that they could trust us to keep enough troops in Iraq and protect their new democracy. Unrest may only be a spasm after our troop withdrawal the way past milestones were exploited by the enemy with attacks to prove our latest step was a failure. I don't assume Iraq's democracy will falter, even though I think the odds of failure are greater without our troop presence. Two CIA documents said the plot reportedly had the support of 500,000 people in Japan, and that the group planned to use a contact who controlled a faction inside the National Safety Agency - a precursor to the Defense Ministry - to help launch the coup. The files reviewed by the AP strongly suggest the Americans were unaware of the plot until after it had been dropped. The plot was developed after the U.S. postwar occupation of Japan ended in April 1952, and the CIA files say American financial support for Hattori's group had dried up by then. And we remained in Germany (where, despite my inability to find the source, I read not too many years ago that the East Germans planned to attack West Germany following World War II with "volunteers", assuming the West would not respond), which is now also strong and prosperous and a friend. So no, it isn't surprising that unrest exists in Iraq between factions or that Iran might plot against Iraq. Iran, Syria, Turkey, and Saudi Arabia probably all have their fingers in there trying to make sure Iraq evolves in ways favorable to them. We are surely doing it, too, despite dropping the most effective tool we had to bend events. We might win even with our self-imposed handicap. But we rely on the Iraqis making good decisions without as much input from us and with more from actors who wish only the worst for Iraq. Yet I worry that too many people around President Obama (and perhaps the president himself) would heave a sigh relief if Iraq fails. They said the war was wrong and that we could not win, and if the price of confirming their wisdom is merely the fate of Iraqis, I think these war opponents would prefer not to have their positions on the morality of the invasion and the chance of success challenged. In that light, is Maliki swerving into authoritarian rule that wrecks democracy a welcome event for these people? In an interview with Foreign Policy on Wednesday from Sulaymaniyah in Kurdistan, a semi-autonomous region where the vice president has fled to evade an arrest warrant, Hashemi declared that the Iraqi political system is "drifting from building democracy to building an autocratic regime" -- and implied that Iraq's prime minister, Nouri al-Maliki, was becoming a new Saddam Hussein. The unsettling coherence is that many on the Left opposed removing Saddam because they said Iraq needed a strongman to hold the place together and suppress sectarian violence. The Iranian- and Syrian-supported sectarian slaughter that peaked in 2006 and 2007 was proof of that need to these critics of intervention and democracy building. In that light, these critics of the democracy project and foreign policy realism might silently be applauding this purported shift to an autocratic regime and simply be interested in making sure that Maliki remains our SOB. And truth be told, even changing Iraq from an enemy under Saddam to an ally under a Shia strongman would be a narrow victory. But if that is all we wanted, we could have avoided a lot of casualties by simply getting out of the way in 2004 to let the Iraqi Shias and Kurds slaughter as many Sunni Arabs as they needed to win the ugly way. But we should not welcome a "stabilizing" dictator who works with America even if in the short run it allows war opponents to confirm our inability to win, the inability of Iraqis to govern themselves, and proof that "realism" that keeps friendly despots in power is the best strategy to avoid chaos. The Arab Spring shows this just puts a lid on the boiling problem. And if we are to have an Arab Spring that actually produces rule of law, it would really help to have a working example making progress in Iraq. And a working example that we will be steadfast in supporting such a shift from autocracy to democracy. We all want victory in Iraq. I just wonder how some of us define "victory." The withdrawal of all American military forces has greatly reduced America’s leverage in Iraq. U.S. military forces were a buffer to prevent political and ethno-sectarian friction from becoming violent by guaranteeing Maliki against a Sunni coup d’état and guaranteeing the Sunnis against a Shiite campaign of militarized repression. I don't think threatening to cancel arms sales (F-16s and M-1s) is the way to persuade Maliki. Arms sales enhance our leverage in the long run and if we exercise our leverage too early, Iraq can buy weapons from plenty of eager sellers around the world who won't annoy the Iraqi rulers about how they govern. Iraq's primary military foe is Iran, remember, so even relatively obsolete planes will beat Iran's definitely obsolete planes. Is it too late to return American forces to Iraq? Of course not! Just decide to do it, seriously talk to the Iraqis about what is needed, and tell the anti-war Left here that they just need to be quiet about snatching defeat from the jaws of victory. Hell, blame Bush and claim the Obama administration needs more time to correct the errors and protect Iraqis from more death than they've endured the last several decades. Nor do I think that encouraging the overthrow of Maliki is the answer. We have to stand by rule of law so that Maliki's opponents can oppose him within the system. All this also assumes Maliki is not responding to real threats, of course. What I've read indicates that this is a power grab. But if Hashmemi is guilty--or just people under him are guilty--trying to totally reverse Maliki's actions will just enable "former" Baathists to continue to plot for complete control. Not that our troops were actively patrolling and fighting terrorists. Iraqis have proven capable of doing that. But our presence was a psychological safety net that Iraqis could (mostly) engage in politics (with too much corruption tainting it, I admit) instead of sectarian warfare to settle differences. Not that Iraqis are doomed because of their ethnicity to fail at democracy. I shudder to think of what Japan and Germany could have turned into if we had left in 1949. But then, the Soviet Union inspired us to remain to defend what we had liberated. Sadly, Iran did not inspire the Obama administration to defend what we'd liberated when the surge broke the back of jihadi resistance by the fall of 2007. What rot. Oh, the basic facts are true. President Bush did negotiate a 3-year agreement with Iraq. Iraqi did insist on having our personnel subject to Iraqi law. And there were divisions about keeping our troops there. But the supposed context that journalists are supposed to provide versus the simplistic notions we bloggers unworthy of legal protections as writers and commenters on events provide is sorely lacking here. Let my non-journalism degree training have a go with the context to those facts, eh? The left here screamed in outrage over the Bush 3-year deal, demanding it be subject to Senate approval where the Democrats would make sure it was not approved. The Democrats, including then-candidate Obama, just wanted to get out as fast as they could run. The assumption was always that this agreement would buy time for a new and more permanent agreement. And I assumed it bought time for cooler heads to prevail by locking in an agreement through the first several years of the next administration. And Iraqis did want our troops subject to their laws. But we had operated for years not subject to Iraqi laws. And we have operated under similar conditions in many places around the globe where we can't trust the local system of justice. But a last-minute White House effort does not negate the failure to find a way to get to a "yes" over the three years of the agreement. Why didn't we unleash that nuanced and "smart" diplomacy we're constantly reminded we have now? Shoot, couldn't we have deployed one of those awesome presidential speeches to the Iraqi people that would just shock and awe them into cooperation? There was just no will to come to an agreement. Period. The urge to retreat has been strong in the Democratic party since the 2004 election, held in check only by the fear of being blamed for losing the war. With Iraqis to blame, the administration felt safe to run. Were the Iraqis divided? Yes. But only the Iranian backed Sadrists wanted us out. Others recognized they needed us. What they were divided over was the wisdom of openly saying they wanted us to stay without any confidence that we could stay. If we have made a strong effort to come to an agreement, with statements saying we'd keep what it took in Iraq to preserve our win instead of leaking numbers like 3,000 that nobody thought was enough to win, Iraqis would have had the confidence to find a way to get to "yes" on the American troop presence question. All the Obama administration wants is a decent interval between our withdrawal and chaos in Iraq. Push that chaos to after next year's November election and they could have a second and final term. Iraq has always been a battlefield for the Battle for the White House, as far as the Democratic Party is concerned. Why should I have ever thought they'd see this as an American war once they were in charge? President Obama can give a nice speech lauding our troops for winning despite the inconvenience that effort was for Democrats who said we could not and should not win the war. But he is unwilling to expend the effort to make sure the loss of life and treasure was for a victory. It is quite possible that this bombing spree was simply a ploy by the terrorists to get press attention, and the Iraqi government will react well and clean up the cells that pulled it off. Bombings will happen on occasion whether we are in Iraq or not. But our presence was some assurance that any bombing is not the signal that the great sectarian war is about to kick off. Even at this late date, I'm disappointed in President Obama. I'm naive that way. I thought victory was something we all really wanted. If we are to have our hard-fought victory in Iraq confirmed, it is mostly up to the Iraqis, it seems. If Iraq succeeds, the administration will claim they led from behind, in their wisdom. And if Iraq fails? Well, that's just Bush's fault anyway.